Mr. Globe Trotter has arrived in Altdorf ( Alt=Old; -dorf=village) a small village in Switzerland. The village is located in a deep valley surrounded by isolated snow fields of 3,000m and higher mountain tops which are part of the Alps. 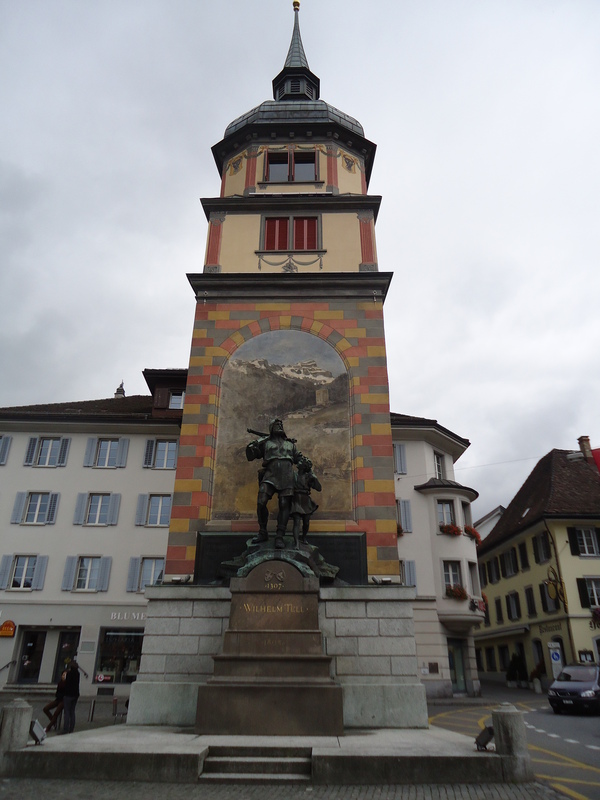 Altdorf is a small town and people know each other and therefore, seem to us, they tend to care more for each other. In Altdorf, a dialect of German is spoken with strong variation in pronunciation and grammar. Many people also speak Italian and French which are also national languages of Switzerland. The climate is about the same as in Cleveland except that we do not know the “Lake-Effect”, which we found very impressive, as we were in Cleveland. The weather condition in Altdorf is a little more moderate compared to Cleveland as the valley is protected by the high mountains to the east and west side. Quite frequently we experience a Chinook wind (warm falling wind), like you know from the eastern slope of the Rockies, which sometimes is raising the cold winter temperature to 18°C (65F). This wind makes every Snowman melt away within a few hours. We eat typical European dishes with influences from Italy and France. The main dish of the day is eaten at lunch and for dinner we have often cheese and bread (different types of 1 to 2 year aged cheeses (so the cliché is true). One of our favorite Sunday dish is sheep with cabbage stew. 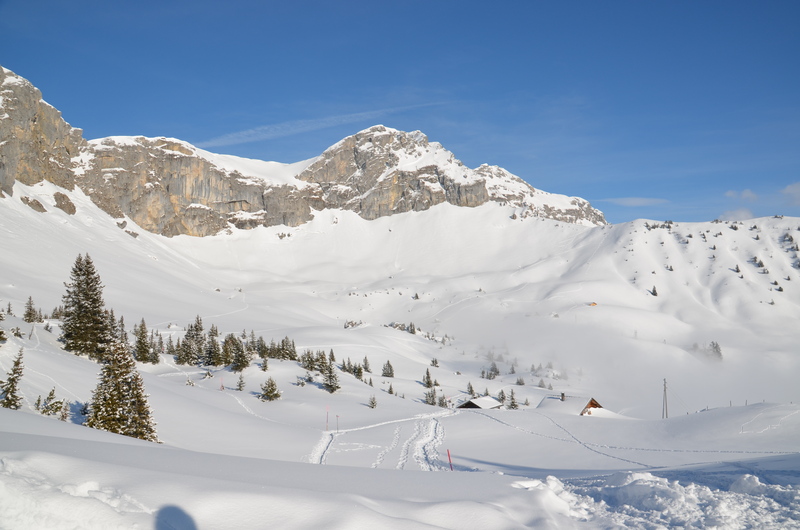 The people are very often in the outdoors enjoying the mountains in winter and summer time. 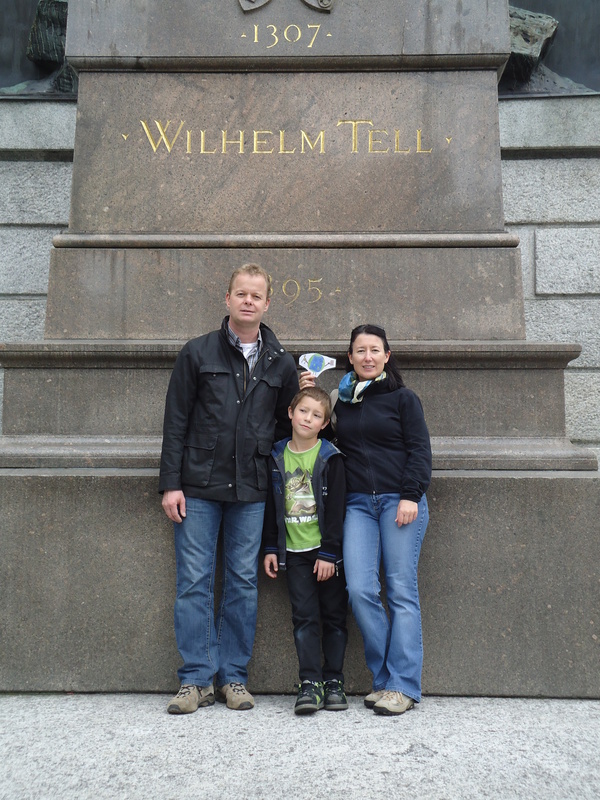 The picture attached shows Mr. Trotter in front of the monument of the national Hero – Wilhelm Tell. ….Hi from your extended Swiss Family………… The myth is saying that through his heroic behavior (Switzerland was founded at the end of the 13th century (1291), a loose confederation of states, which lead to Switzerland as we know today, was formed. Some say the story of Wilhelm Tell is just a fairytale the other say it’s true. The second picture shows a snapshot from the mountain around Altdorf we can reach by means of a cable car within 20 min or so. Today, with all the violence around the globe, it is interesting to note that Switzerland has a long history of armed neutrality —it has not been in a state of war internationally since 1815. So it’s time to say good-bye to Mr. Globe Trotter and we wish him the best on his trip to ASIA. Was nice getting Mr. Globe Trotter to know. We hope to hear from his further adventure soon. Thanks Baumanns! Love to you all!